Visitors are greeted at the entrance by a huge crocodile mouth in which they must enter to access the reception area. Through a maze of paths and walkways, one can observe reptiles in their daily lives: lazing in the sun, bathing and demonstrating the power of their jaws during their meal. 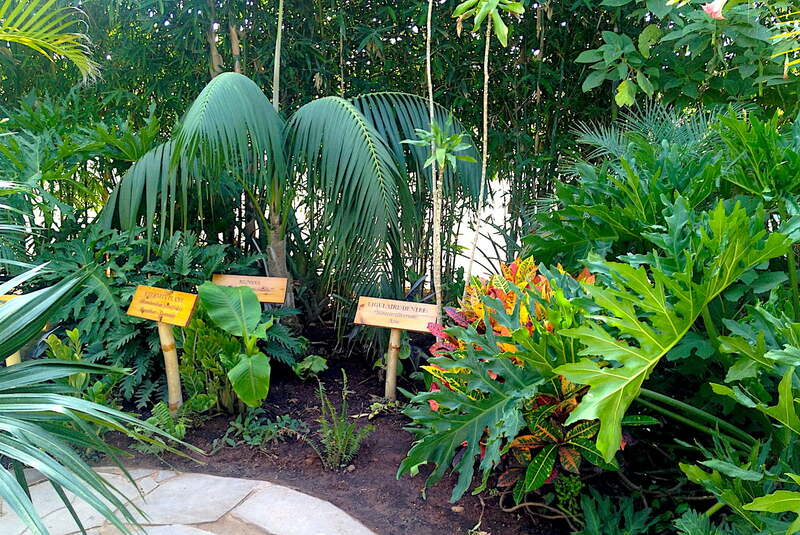 The circuit, with a length of over 600 meters, is marked by informational signs to learn not only about crocodiles, but also about the different plant species which inhabit the crossed gardens. More than 300 crocodiles await you. Present in Morocco until the 1970s, crocodiles have gradually disappeared due to hunting but also drought. 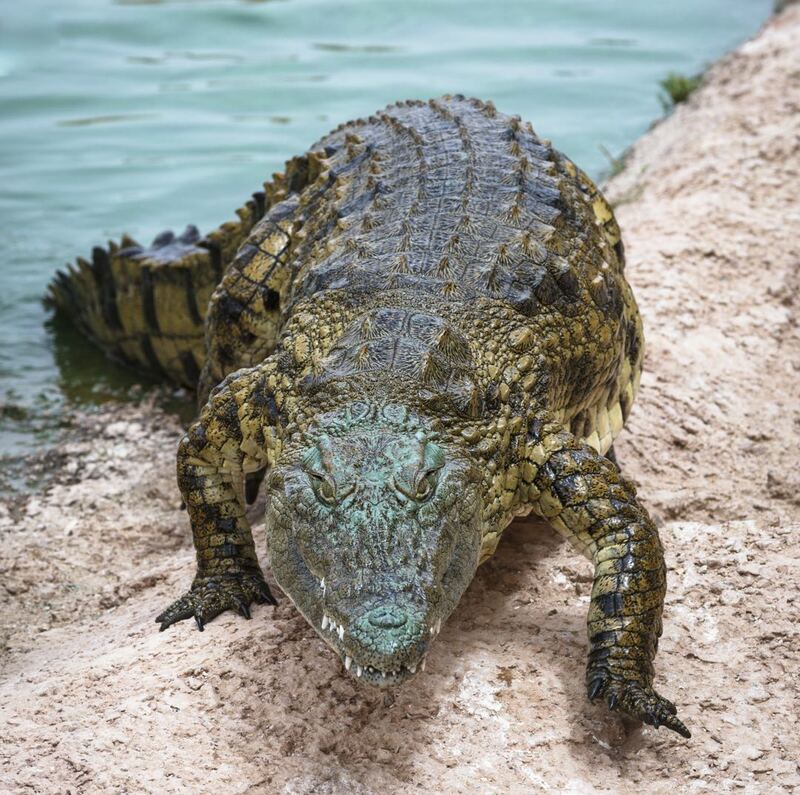 The resident species of the park, the « Nile Crocodile », can reach up to 7m long and weigh up to one tonne. 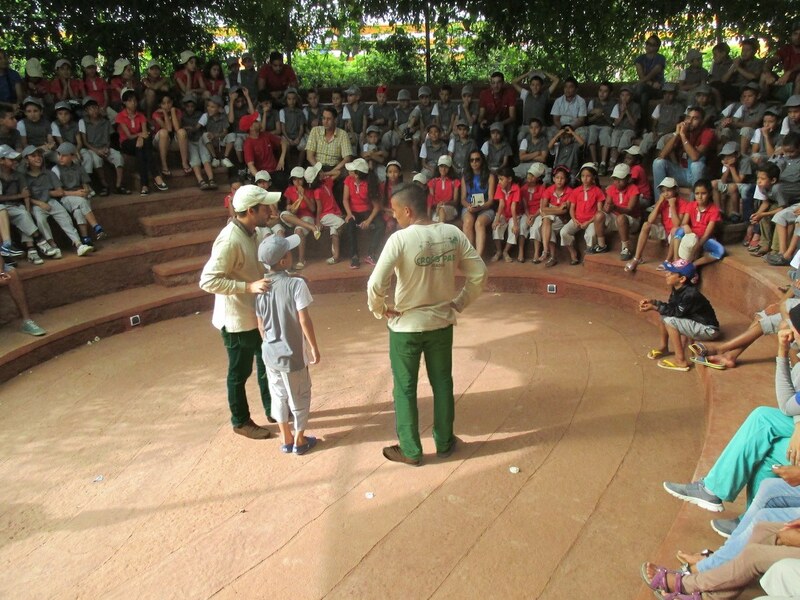 As part of a strategy to safeguard the species, Crocoparc facilitates access to knowledge about reptiles through educational panels and the presence of multilingual guides. 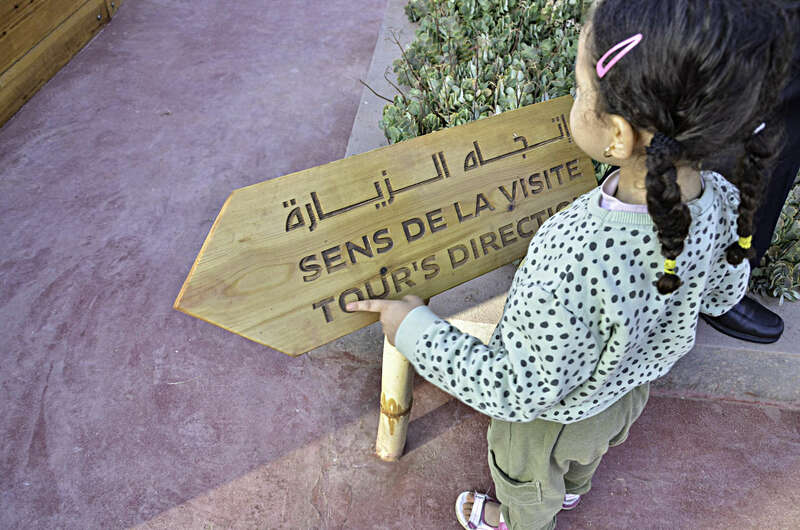 With more than 300 species of exotic plants from all over the world, you will be able to make your children travel across the continents to discover an extraordinary flora. Throughout your walk you can dream and smell divine perfumes distilled by jasmine, gardenias and other fragrant plants of the five thematic gardens. 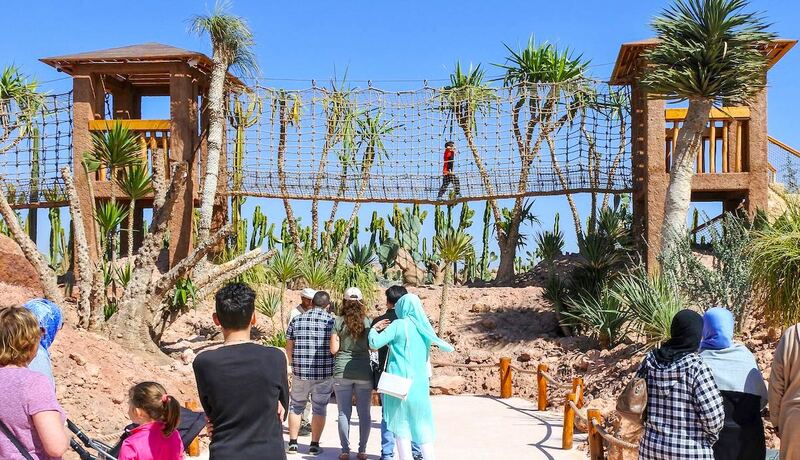 During your walk, you will discover the new spaces of “The Cactus Garden”: “The place of Aloe vera”, “place of Nolina of America”, “place of the island Red Madagascar”, and many other things. 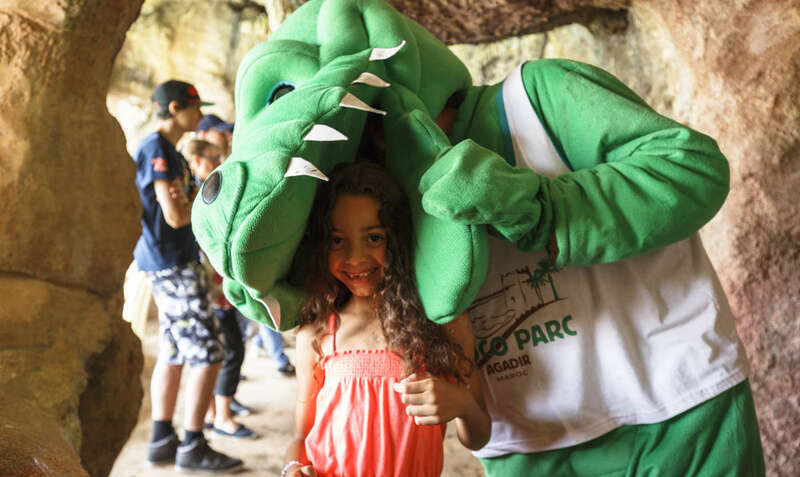 During their stroll, visitors are pleasantly surprised by the waterfall and its breathtaking cascades, the treasure cave – beloved by children and the rest areas which are available to them, for the crocodiles and other animals which arouse their curiosity, along with many other amazing surprises that punctuate the visit. Incorporating international safety standards, playgrounds are constructed of local wood (eucalyptus) and fit perfectly into the landscape. 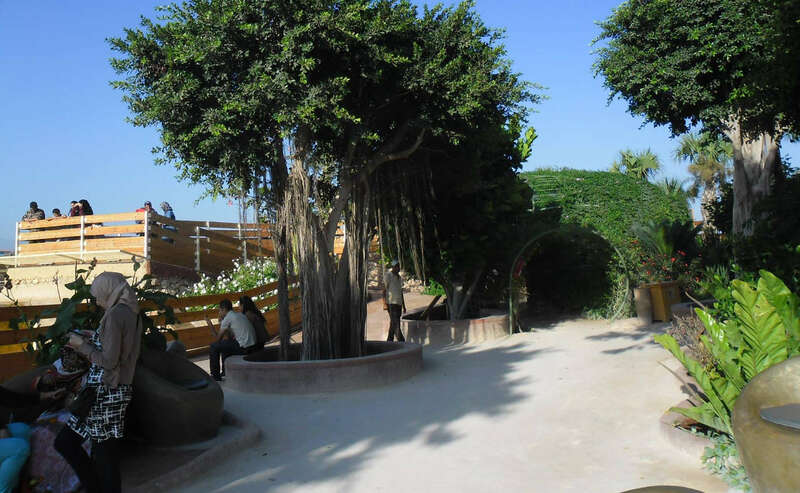 The small area near the restaurant offers a young crocodile spring, water slides, a suitable balance with a climbing route map that allows access to a tower. The largest area of the circuit, named “the route of the crocodile”, includes eight carved crocodiles, some of which are entangled into the equilibrium paths, walkways and two climbing towers. Throughout the year, the Crocoparc animation team offers children workshops of all kinds: mask, face painting, coloring, origami, puzzle, pottery, etc. Comfortably installed, children can let their creativity go while enjoying the gardens of Crocoparc since the workshops are done outdoors. 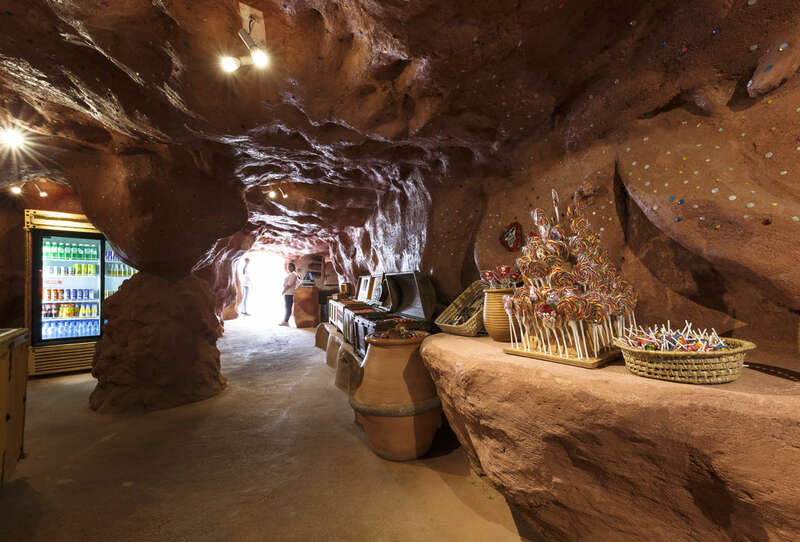 This mysterious place offers drinks, ice cream, snacks, sweets, barbapas, etc., enough to make a gourmet break during your visit. 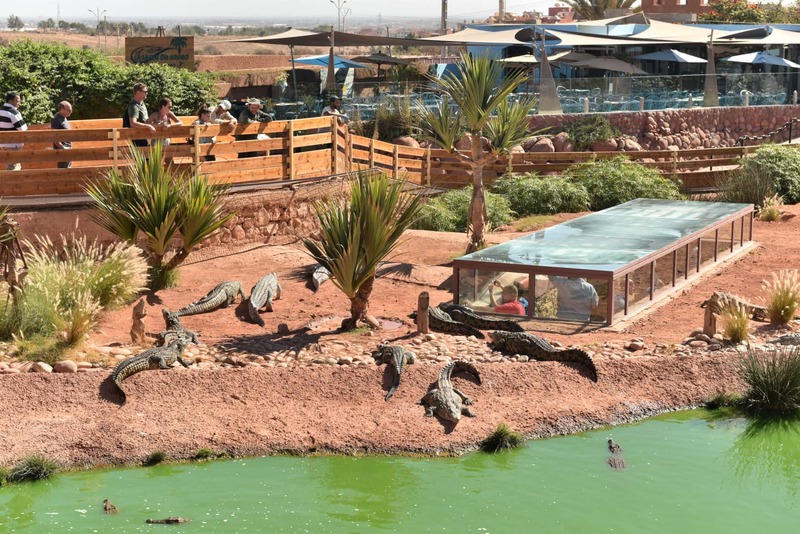 First crocodile conservation center in Morocco, accessible to the public, this laboratory “alive” allows visitors to enjoy a unique show, to learn about the evolution of crocodile life. Along the circuit, visitors can take a break and settle in “stone” armchairs in this exotic place, and thus take time to enjoy the released serenity in this place and admire the various plant species which populate the garden. 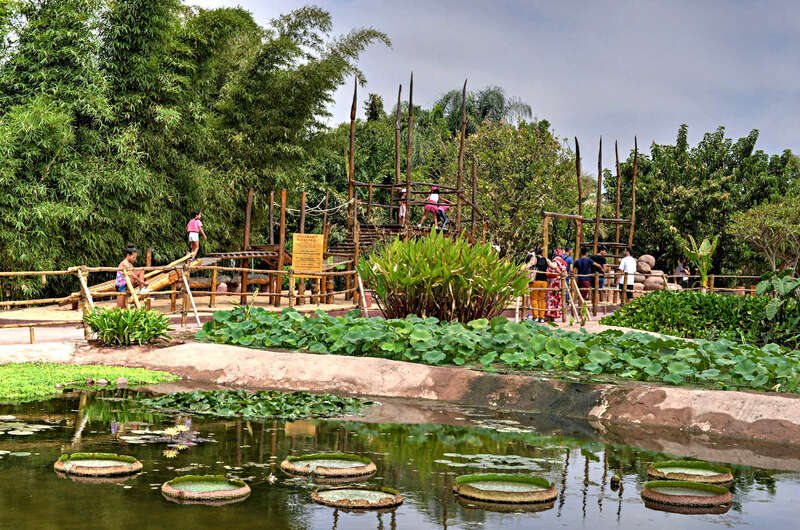 In another area, close to the crocodile ponds, benches are available for visitors – a perfect place to watch and learn how the crocodiles move around in their habitat. 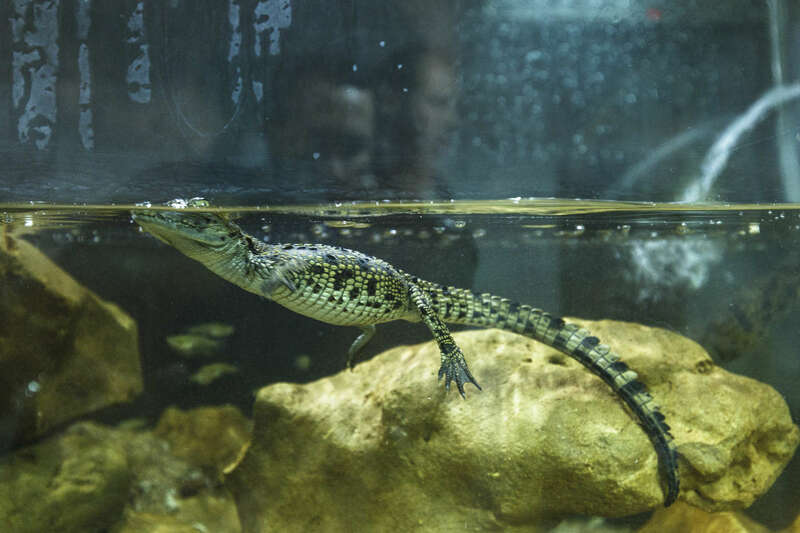 This space welcomes a large number of spectators for animations, educational presentations and explanations about animals, along with recounting stories and legends about the crocodiles. Documentaries are also broadcast in this location. 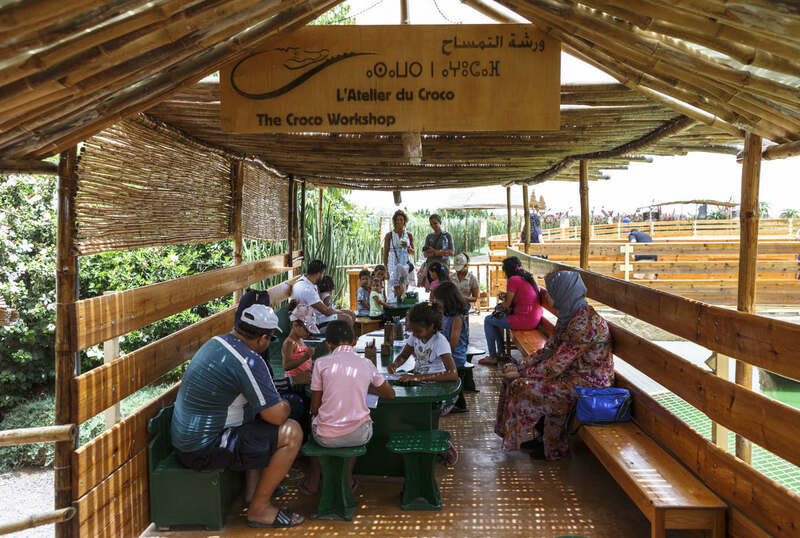 At the bend of a path, facing the small play area, visitors can take a meal break at the restaurant “La Table du Croco” whose terrace overlooks a pond, allowing them to observe and discover more about crocodiles while having their meal. Finally, before leaving, there is a shop at the heart of the jungle which offers the visitor the opportunity to purchase fluffy toys, mugs, T-shirts and other memorabilia items of their visit. 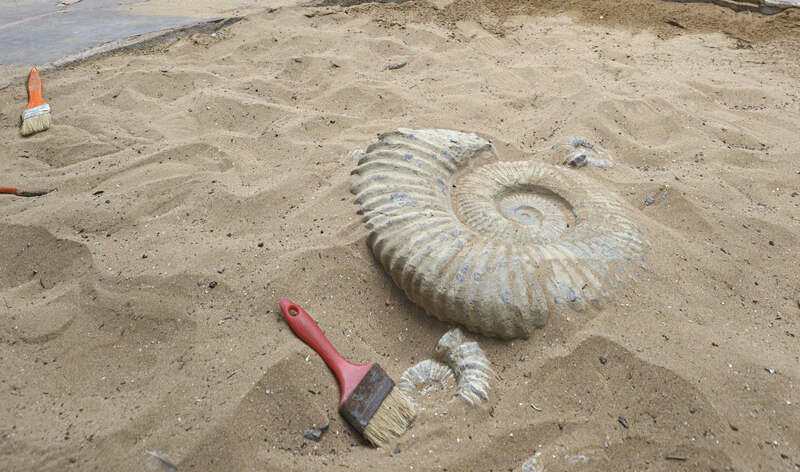 Thanks for your visit, see You soon!